Looking for a few good nerds. You know, I’m thinking the apocalypse may not be so bad. 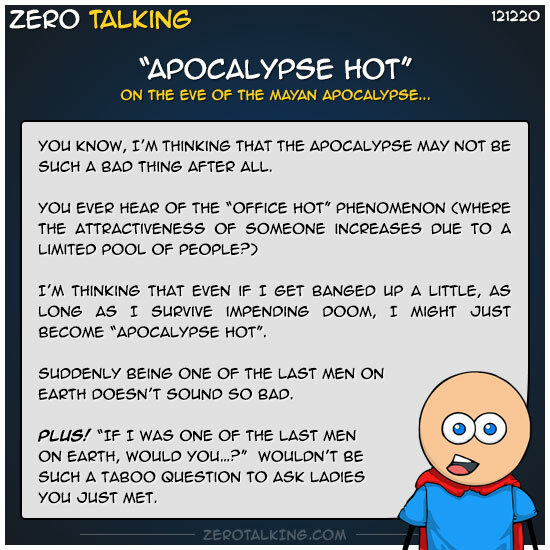 I’m thinking that even if I get banged up a little, as long as I survive impending doom, I might just become “apocalypse hot”. Suddenly being one of the last men on earth doesn’t sound so bad. — wouldn’t be such a taboo question to ask ladies you just met.